Pupils from Hilton and Lochardil Primary Schools attended Inverness Caledonian Thistle FC on Thursday 27 September 2012 for a Show Racism the Red Card Event organised in partnership with Inverness Caledonian Thistle FC. The event featured three educational workshops in the morning promoting messages of equality and respect, and the pupils also received a stadium tour. During the afternoon the Show Racism the Red Card screened their brand new anti-racism educational film, which features some of the game’s greatest players; Thierry Henry, Ryan Giggs, Rio Ferdinand and Didier Drogba. Guests on the day included first team Inverness Caledonian Thistle players Owain Tudur Jones, Gavin Morrison and Philip Roberts, ex-professionals and Show Racism the Red Card coaches Brian Irvine, Derek Ferguson and Gary MacKay, along with Philippa Clark from UNISON Scotland and Chief Inspector Colin Souter. The guests spoke about their experiences of racism and sectarianism and offered advice on how to deal with, and combat, racism and sectarianism whenever it occurs. Amanda Peebles, Show Racism the Red Card said, "The continued support received from Inverness Caledonian Thistle FC demonstrates a clear commitment to stamping out racism and sectarianism in football and society. This kind of work equips young people to deal with racist and sectarian attitudes and behaviours. Schools in the area are very keen to engage with the campaign and the young people we have worked with are very positive about it. 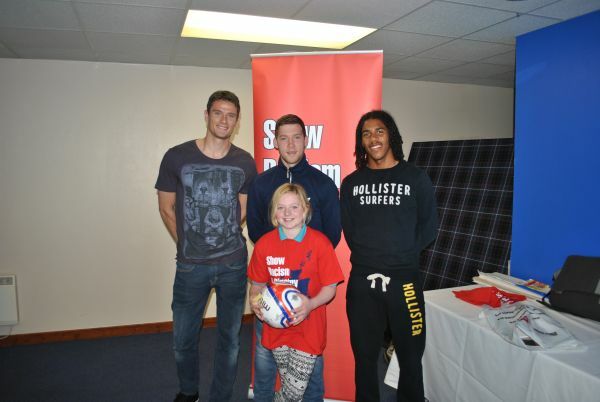 Pictured above: Inverness Caledonian Thistle FC players - Owain Tudur Jones, Gavin Morrison and Philip Roberts with a primary seven pupil from Hilton Primary School.